Today is certainly the right day to tell you all about my time in Mexico! As I sit here and watch the snowfall I think back to warm, sunny days in Oaxaca. They say that the weather each of the first days of the new year will determine the weather for coming months – if it is raining and cold on Jan 2nd, then February will be rainy and cold. If it is sunny and hot on January 3rd then March will be sunny and warm. Every day was sunny and very warm so Oaxaca is looking at a very warm, sunny spring! The trip was a great success. I was able to meet with the 10 weavers and go over the next workshop with them. 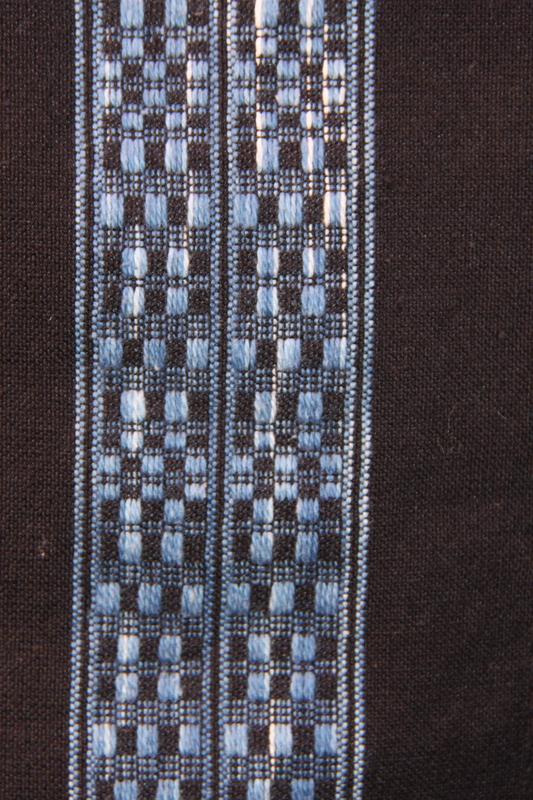 The upcoming workshop will focus on weft ikat and will work as a lab. The participants will bring their own yarns pre-dyed with natural dyes in reds and yellows. We will again work with indigo, over-dyeing to give purples and greens. 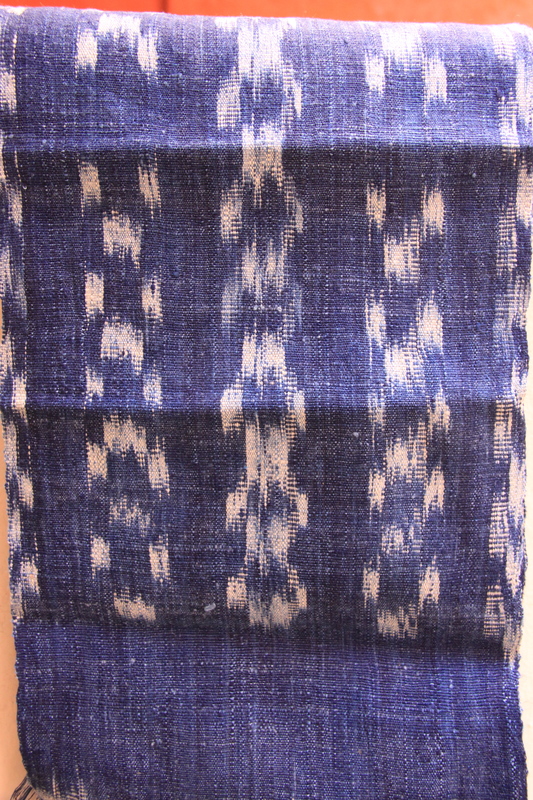 Several of the weavers have continued to work with the ikat techniques they learned in September. 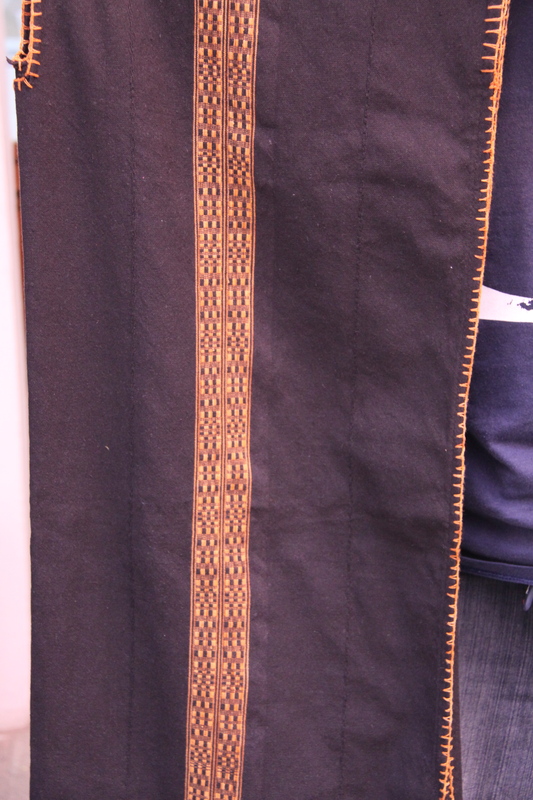 Arturo told us he sold 5 shawls in one week that were done with ikat. Because they all sold we didn’t get to see them! Moises brought a beautiful silk scarf to show us. And Alfredo brought 2 dresses that incorporated ikat. The museum has invited me to give three workshops in 2011 – I am so honored and excited! 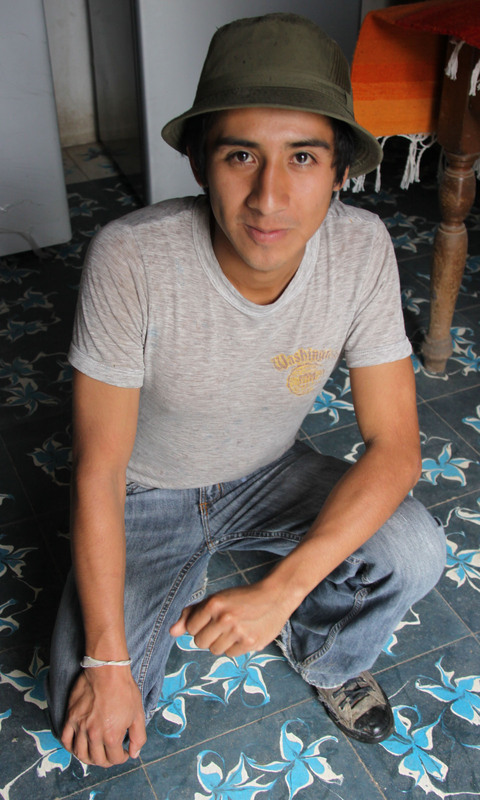 My main purpose in traveling to Oaxaca was to hand out the scholarship and micro-loan. We did not let anyone know that this was why I was there and made arrangements to meet with the recipients in private. Eric and David, representing the Museo Textil de Oaxaca, and I made arrangements to travel to Jose’s home in Teotitlan so that I could photograph his latest weaving. 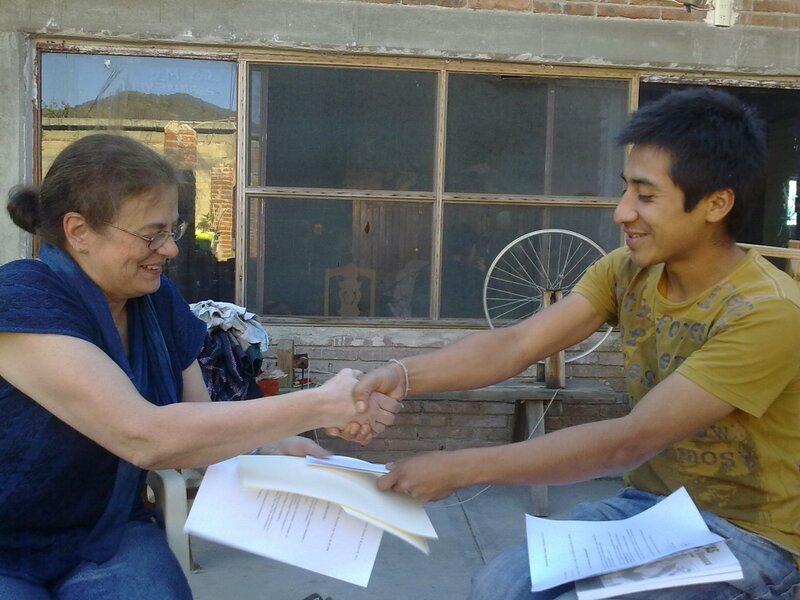 When I was done we asked if we could sit and talk – then we surprised Jose with the scholarship. He was stunned. The scholarship is for Creativity & Experimentation. The piece Jose weaves will be exhibited at the Museo Textil de Oaxaca in June and then it will come here to Brooklyn to be on exhibit in July. The piece will be for sale – 10% of the proceeds will go towards another scholarship. I cannot wait to see what Jose does! 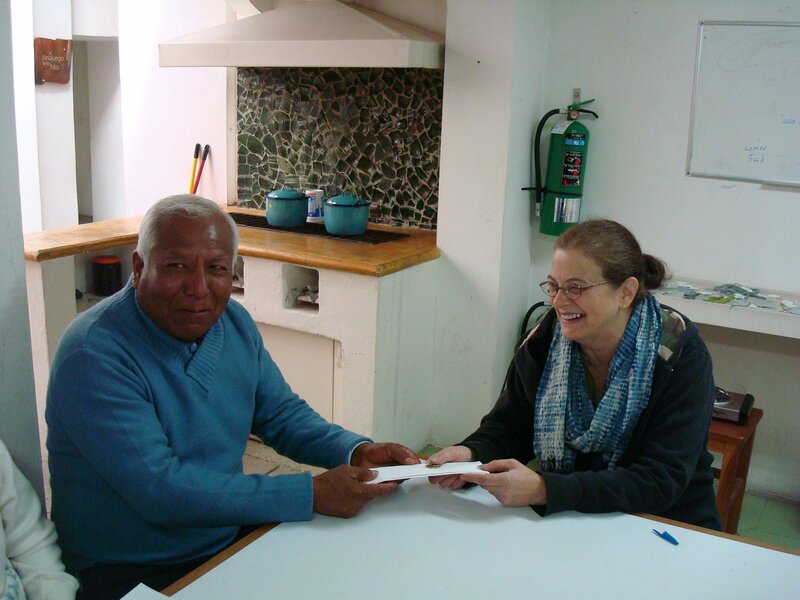 Next we made arrangements to meet with Eufrosina & Esteban at the museum telling them I needed to do another interview with them. I cannot tell you how surprised they were to learn they weren’t there to be interviewed instead they would be receiving a micro-loan to help them purchase a loom – they were both speechless. At the end of my stay the weavers invited me to lunch – including folks from the museum there were close to 20 of us. It was at this lunch that we told the other weavers about the scholarship and micro-loan. 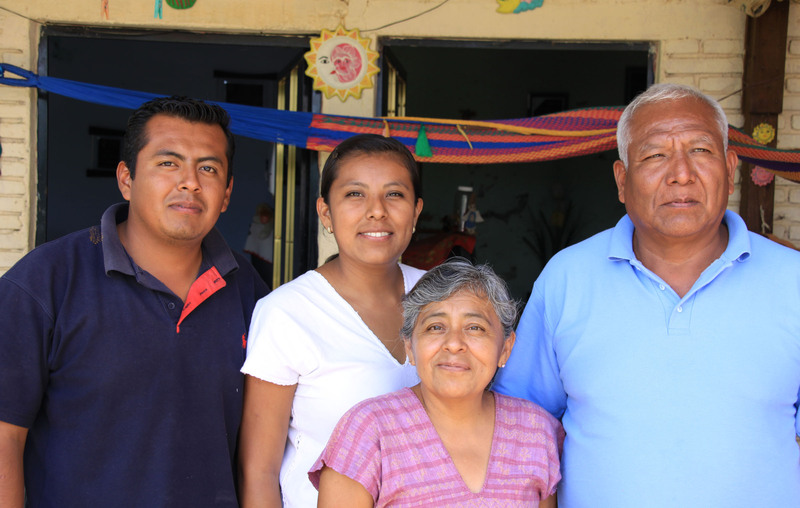 They were so pleased for Jose, Eufrosina & Esteban and thrilled to learn that this program will continue to be available in the future to help others. I explained to everyone that this money was not coming from me – but from a wonderful group of people who care very much about them. They are so thankful that strangers from so far away would do this for them. They asked me to say Gracias to you all! Author Linda LaBellePosted on January 26, 2011 May 19, 2017 Categories MexicoTags Ikat, Indigo, Indigo Workshop, Museo Textil de Oaxaca, Natural Dyes, OaxacaLeave a comment on Oaxaca update!